Event Horizon Chronicle: If You're Thinking of Leaving, Why Wait? If You're Thinking of Leaving, Why Wait? If you're going to get out, the best time to escape is before it's too late. A month early or a year early -- it doesn't matter too much. But one day too late is still too late, and that does matter. I have a lot of readers in the USSA, Canada, England, and also in France and Germany. Why do you stay? Why aren't you heading to the southern hemisphere, to sub-Saharan Africa and South America? Do you really think things are going to improve? I once considered moving to Europe -- to Spain, France or Germany. Now I am glad I did not. I also considered a few countries in sub-Saharan Africa. I think it could have worked O.K. for me. I am from the South (in the USSA) and to me it is natural to live around, work with and mingle with people of Black African origin. But in the end, I came to South America and I intend to remain here. The unresolved and probably unresolvable issue of the catastrophically failed nuclear power reactors and spent fuel pools at Fukushima Daichi in Japan in itself is reason enough to leave the northern hemisphere. I regularly browse the Energy News website and the outlook is profoundly grim. Click the link. Go back through the news archive and read the great volume of evidence that suggests the northern Pacific Ocean is dying right now. As radioactivity pours into the sea from the failed nuclear power complex at Fukushima Daichi it is being concentrated in the food chain and working its way upward. The human race is at the top of the food chain. A huge amount of food comes out of the northern Pacific Ocean to feed people in Japan, China, Korea and also in the United States, Canada, Mexico and many other countries. The marine ecology in the northern Pacific Ocean is massively failing now. What happens when this bountiful food supply is no longer available in the coming years? And I am not talking about the far distant future. This scenario will play itself out in the relatively short term. The northern jet stream has also widely dispersed dangerously poisonous radionuclides from Fukushima Daichi all over the northern hemisphere -- in Canada and the USSA, but also in Europe. Some has crossed over the equator into the southern latitudes, but the great bulk of it has remained north of the equator. If you live in North America or Europe you have been well dusted with radioactivity from Fukushima Daichi. If you eat seafood that comes out of the northern Pacific Ocean you are playing radioactive Russian roulette with your personal health. Had any Alaskan king crab lately, or Pacific salmon? If so, why? But Fukushima Daichi is the least of it. There are hundreds of other nuclear power plants, and something like 99% of them are in the northern hemisphere. They are notoriously complex, high maintenance, prone to catastrophic failure and all of them are ageing. In the event of an emergency situation, they quickly fail, melt down and/or blow up (as at Chernobyl, Ukraine and Fukushima, Japan) and can never be repaired. They then spew massive amounts of deadly radionuclides to the global environment for a geological age to come. There are one hundred of them in the USSA; there are still more in Europe. It is virtually a certainty that more of them will be failing, melting down and/or blowing up in the coming years, maybe even later this year. A lot of the nuclear power reactors in the USSA are directly on the sea coast, or on major rivers, and/or near major cities and/or near major military bases. If there is a shooting nuclear war, or serious natural disasters such as tsunamis, major earthquakes (on the New Madrid Fault, for instance), powerful storms, etc., multiple nuclear power plants will either be destroyed or fail, maybe even scores or hundreds of them, as would easily be the case in the event of a nuclear war. You can bet on that. And the northern hemisphere of this planet will then become a sterile, "no go," Death Zone. I am not being alarmist in the slightest. The average person has simply not thought through the dire implications of having built all of these hundreds of ticking time bombs called "nuclear power plants" and sprinkling them all over the world, almost all of them in the northern hemisphere. Let me impress upon you that I am not being melodramatic about the possibility of a shooting nuclear war. A wide range of political commentators and analysts are warning about the real risk of nuclear war, including well-known public figures such as Mikhail Gorbachev and Dr. Paul Craig Roberts, and many other, well-known and less-well-known figures. If NATO and the USSA continue their economic and military pressure against Russia, the situation could deteriorate from a Cold War into a hot, military conflict that could easily turn nuclear, with terrible consequences. In the Eastern Pacific region, there is also growing tension between the USSA, and China and North Korea. If these "cold" conflicts turn hot and result in a nuclear exchange the results will be catastrophic for the entire planet and all of humanity. The initial, horrific loss of life and destruction of property as numerous cities are incinerated in nuclear mushroom clouds will be bad enough. But there are horrific, follow-on results, among which nuclear winter is the least serious, though nuclear winter in itself will exterminate people by the hundreds of millions, due to massive food crop failure, owing to low temperature extremes and lack of adequate sunlight for photosynthesis in food crops. You see, if cities like Houston, New York City, Washington, DC, Chicago, Miami, Phoenix, Norfolk, and many more, are destroyed by massive nuclear blasts, then the nuclear power plants that are near these cities are likely to fail. If the crews are dead and/or cannot come to work, then the nuclear power plants will fail; they will melt down and/or explode. If the power grid on which the nuclear power plants depend has been destroyed, then the nuclear power plants automatically fail; they melt down and/or explode. This implies the extinction of a great deal of life in North America, both human life and wildlife. In the case of melted down and/or exploded nuclear power plants on the East Coast of North America, and there are a fair number of them, the radioactivity would go right into the ocean. That matters a great deal, because the Gulf Stream from the Gulf of Mexico flows right up the East Coast of North America and then turns eastward, and crosses the Atlantic Ocean to Europe. The failure or destruction of nuclear power plants on the East Coast of North America therefore is a life and death matter for the North Atlantic Ocean and also for the countries and peoples of Europe. 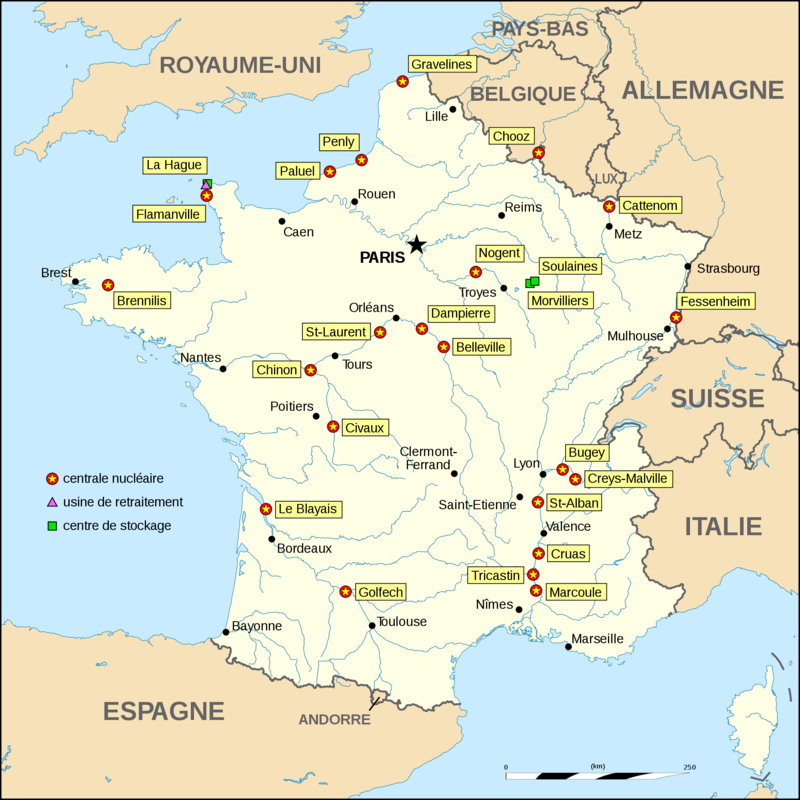 Speaking of Europe, look at this map of the nuclear power reactors in France. They're all over the country, from north to south, east to west. Let's say that France goes to war against Russia, as a member of NATO and a military ally of the USSA. If NATO employs nukes against the Russians or their strategic interests, then the Russians are likely to respond with nukes. If there are multiple nuclear strikes on French soil, does anyone have any illusions about what the implications would be for the French national power grid and the survivability of the French nuclear power reactors? It would mean the end of French civilization and the French nation. Finies. Finished. And much of the rest of Europe. Look at the map. Click the link. The nuclear reactor at Fessenheim is on the Rhine river. The failure of that plant means the death of Strasbourg, which is just downriver, and then Mannheim, in Germany, which is also downstream, and so on, city after city, and then the Rhine empties into the North Sea, which itself empties into the North Atlantic Ocean. You see the cascading, radioactive, ecological problem. There are also several nuclear power plants up and down the Rhône river, in southern France. If they fail, it means the death of the Rhône. But it doesn't end there. The Rhône empties into the Mediterranean Sea, which would then also be massively radioactively poisoned. Of course you have heard of the failed, exploded nuclear power plant at Chernobyl, Ukraine. That plant has never been and cannot be repaired. It will remain dangerously radioactive for untold thousands of years to come. The surrounding region is a poisonous no man's land. What many people overlook, including many prominent analysts and commentators, such as Paul Craig Roberts, is that there are several other nuclear power plants in the Ukraine. Please click here to see their locations. Note that the Zaporizhia nuclear power plant is just to the west of the present combat zone in the eastern region of the Ukraine, and not far north of the Crimea, which is now part of the Russian Federation. It is the largest nuclear power plant in Europe and the fifth largest in the world. It is also right on the banks of the Dnieper River, which empties into the Black Sea, which in turn empties into the Mediterranean Sea. Failure of the Zaporizhia nuclear power plant will massively radioactively contaminate the Dnieper River, which will then flow into the Black Sea and radioactively contaminate the Black Sea, which then flows into the Mediterranean Sea, etc. You see the problem. Just northeast of Odessa is another, the South Ukraine nuclear power plant. Many armchair analysts, including commentators such as Paul Craig Roberts, have publicly advocated, or come very close to doing so, that Vladimir Putin send his military racing across the eastern and southern regions of Ukraine, in a blitzkrieg from the Russian border all the way to Transnistria, on the border between Moldova and the Ukraine, in order to incorporate that swath of territory into the Russian Federation, and present NATO and the regime in Kiev with a military fait accompli. In my view, Putin has not done that because no military operation is ever as simple as it appears on paper; what can go wrong frequently does go wrong. And there are always unexpected complications. Beyond that, Vladimir Putin knows that military combat produces societal disruption right across the board. It also can and does produce a lot of physical damage to key economic and industrial infrastructure -- things like roads, bridges, railroads, electrical power grids, airports, factories -- and, oh yeah, nuclear power plants. Zaporizhia is already dangerously close to the active combat zone. What happens if it comes under artillery bombardment? Or what if the electrical grid goes down, due to heavy combat in the region, and the several nuclear reactors and spent fuel pools melt down and/or blow up? The Crimea is due south a short distance, and southwestern Russia, as well as the ethnically Russian region of eastern Ukraine, are directly downwind. If Putin were to order his army to cross the border and drive west to Transnistria, then the South Ukraine nuclear power plant would also be in danger of catastrophic damage or outright destruction from military combat. That would only compound the military and political situation and result in an apocalyptic scenario that would lay waste a wide geographic area for all meaningful human time to come. The devastation would be multiple times worse than that from Chernobyl and Fukushima. I believe that this is an important factor in why Putin has stayed his hand. The risk is not worth it. He cannot trust what NATO and the USSA might do as the Ukrainian positions would be overrun. Would they resort to a radioactive, scorched earth retreat? Would they blow the nuclear power plants and falsely blame the destruction on the Russian army? Putin cannot know for sure, and so he cannot trust the USSA and NATO. He is therefore playing for time and using a variety of means, short of overt military conflict, to try to defuse both the crisis in the Ukraine and the economic and military confrontation that NATO and the USSA are forcing on Russia. My reading of Putin is that he is a reasonably sane man who would prefer not to see nuclear hell on Earth, especially not hard on the borders of his own nation. And so he is acting in a restrained, cautious, measured manner. Lamentably, the same cannot be said of the leadership in the USSA and a number of European capitals. And so we drift towards war, a war that will potentially devastate Europe and North America, at the least. Which is why it must not happen, and still the Madmen and Demons on the Potomac and in the City of London are driving the world to war. God help us, because they apparently intend to kill extremely large numbers of people.